Tri-level Liberty Wharf seafood restaurant with a range of dining milieus. 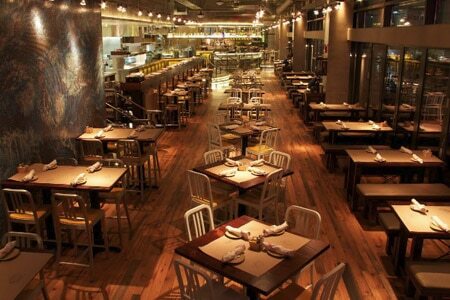 : This enormous waterfront outpost of Legal Sea Foods at Liberty Wharf is situated on three levels, each with its own unique menu. On the first floor, there is a massive circular bar that overlooks the patio with outdoor seating and a view of Boston Harbor. Order up a local brew and share a small plate of tuna crudo bruschetta before proceeding to the oyster bar to indulge in some Wellfleet, Bluepoint or Cape Spear Salt bivalves. Head up the massive staircase to the second floor for a more formal and intimate dining experience. The menu is also more upscale with innovative dishes like seared foie gras with chocolate brioche, crispy pig’s head and butter poached lobster. If you come for drinks and appetizers, don’t miss the third floor roof deck that is open year-round. In the warmer months, the retractable glass roof opens for al fresco seaside snacking, while in the colder months, you can warm up by the fireplace. The limited menu features a raw selection, some spreads with grilled pita and sandwiches (think lobster roll or open-face crab meat).